It is absolutely clear that better, broader education will be essential in creating a positive future of work. However we still need to work out precisely what is the education that will be most relevant for tomorrow’s world. 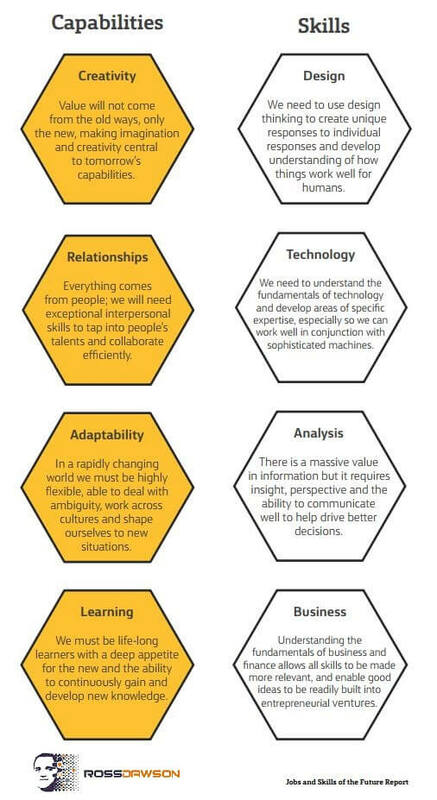 One of the relevant distinctions I drew in my recently launched Commonwealth Bank jobs and skills of the future report was between Capabilities and Skills. The diagram on the left shows some of the capabilities and skills I identify as most relevant for the future. The current focus on Science Technology Engineering & Mathematics (STEM) education in many countries is important, as these are fundamental skills in a world driven by technology. I believe that design skills will also be at the heart of value creation, as we ensure that new technologies are designed to be useful and usable for their human users. Analytic skills will be critical. This is not just about data science, though that is a very high-value domain, but about distilling insights and communicating them in ways that are accessible and relevant to individuals. And business skills are in some ways the ultimate pragmatic skills, making personal and organizational initiatives create measurable value. However knowledge and skills without intrinsically human capabilities are of limited value. People who have only knowledge will not be useful in a dynamic work environment. As described in the report and illustrated in my Humans in the Future of Work Framework, rapid shifts in the world of work are forcing us to focus on our intrinsic and unique human capabilities, those that distinguish us from machines. Creativity across domains remains a distinctive human capability, while relationships, empathy and the ability to motivate others will continue to remain at the heart of value-creation in work. In a world of rapid change, adaptability and resilience are fundamental capabilities. The ability and inclination for continuous learning will be absolutely essential. There is no knowledge or skill that will not erode in a changing world, so we will have to continue to learn throughout our lives to create value through our work and keep ahead of machines. Almost all of today’s educational institutions – save perhaps kindergartens and pre-schools – have traditionally focused almost exclusively on developing knowledge and skills. Fortunately that is in some cases beginning to change. Today we need to radically re-think the nature of education to focus at least as much – if not more – on distinctive human capabilities as on specific skills. That will require education systems very different to those we have today. It is time for action.